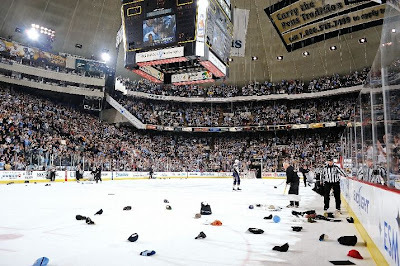 We all bow before King Crosby: Sidney Crosby's hat trick gladly caused extra work for the Mellon Arena employees, as 87 led the charge in a 5-4 win over Buffalo last night in Pittsburgh. It was not a very encouraging game for any fans of Team USA, because Buffalo goalie Ryan Miller, who will represent his country in the upcoming Olympics, was clearly perplexed by the dryer-destroying center. Then again, maybe it's just a case of the Pens having Miller's number. The Sabres' netminder is 2-5-2 in his last nine games against Pittsburgh. The Penguins rallied from a 3-1 hole by scoring four of the game's next five goals, with three coming from Crosby and one coming from the red-hot Jordan Staal, his 14th of the season. Marc-Andre Fleury bested Miller for the win, stopping 3o of 34 Sabres shots on the evening. Polamalu to appear in new Super Bowl ad: Troy "Coca Cola Head and Shoulders" Polamalu's non-football career continues to boom, as he was recently cast in a spot for truTV that will air during the Super Bowl. This one is expected to air during the second quarter of SB44. Programming note: The Paul Zeise/Bob Pompeani blogger-irresponsibility claims are a hot enough topic that they will be discussed on the #1 Cochran Sports Showdown on KDKA after Sunday's 11 PM news, I've just learned. Four journalists talking about blogs? Let's just say I'm prepared for the worst. 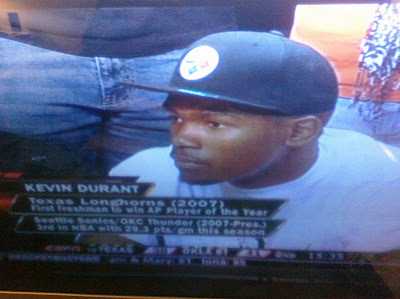 The Pistons need to make a trade for Durant so he ends up playing in Pittsburgh. Troy is making a run at Peyton Manning for endorsements! Hopefully this influx of extra money will satiate any lust for riches he has and maybe make a "hometown discount" more likely to keep him in Pittsburgh for a long time. Staal's goal was quite a beauty, with a very nice setup from Geno. I don't really want to see that line stay together for the long run, but it's always nice to know we have that one in the pocket should we need it. Would the team have been better off without signing those players? Maybe, but those players were signed purely to pique interest after the lockout. Point is, not every move made every year is towards winning that particular year. I don't know if that makes any sense, but i'm willing to give the current group of Pirates a chance, they have no choice who their owner is. And i'm not thrilled with the current ownership as it is, so if they don't hold up their end of the bargain and sign these young Bucs when the time comes, bring out the pitchforks and torches i say. If all stays bad for the Pirates (gee, what are the odds) and in a few years they are still a joke, they'll simply hire a new GM, gut the team and make a couple front office shifts and everyone will be back on the wagon with hope that things are different this time. Of course there's no precedent for this, it's only happened how many times since '93. I don't think Mario had that much input over the choices Craig Patrick was making, if he did and CP was simply appeasing Mario's wishes, he wouldn't have fired him and he wouldn't still be unemployed. But then again Mario probably didn't stop him from getting those players either. The worst thing a hockey team can do is completely overhaul it with old, set in their ways FA's and expect it to click no matter how good those players are. A team and it's chemistry has to be grown and that's why that Penguins and all those similar high priced Rangers teams failed. Steve, why would you think that? They have never done anything like that before! I absolutely agree with the importance of chemistry contributing to the success of a hockey team. Speed and hardwork can go along in putting a team over the top. You don't need the most talented players in the world, just the right ones. I seem to remember a similar quote from some Hockey know-it-all named Herb Brooks, but what did he ever do to back it up? Chemistry is just as important, if not more, than leadership in my opinion. I think after Patrick was gone, Mario knew what to look for in the latter department (Gary Roberts and Bill Guerin being the most prime examples--and I also give props to Shero for prying them away from their teams for a pittance). I am in no way comparing the Pirates and Penguins, but I prefer the Pirates do what they are doing in regards to the bullpen than go out and try to sign a big name position player, or starting pitcher for that matter. Let the kids keep developing some chemistry (it worked for the Marlins after their respective fire sales) and besides, what big name player would they have even had a chance at signing this winter? Name one. Cheer the team if you want to, or be completely apathetic towards them. But stop complaining that Don keeps putting stories on HIS blog about them. He's expressing the same jaded outlook as most of you if you haven't noticed. Oh yeah, nothing better than 4 ridiculously awful journalists talking about something they barely know anything about. Wait a minute, that's what they do all the time anyway. Don, I'm buying you a beer if they mention Mondesi's House. Hey, i am as jaded a Bucco fan as any. But I never disrespect Don for anything he posts on here, this is his blog and IMHO he does a great job running it. It's hard to be a Pirates fan, but you won't see me backing a horse by any other name. I will also buy Don a beer if MH get's some mention. Wasn't Pomp and others using that 'Eklund' blogger back when the lockout was going on and reporting it as the near gospel? I remember Steigerwald clearly was. Blogs are like everything else in life: Some good ones (like this one), ones that have no credibility (Black Shoe Diaries), and a lot of in between. It's like comparing Pomp with Jory Rand, or Fedko. Think that may change his mind? The F***Ing Sporting News would beg to differ. You don't like Penn State. We get it. The personal attacks on me, and the purely homeristic attacks on BSD are not necessary. BSD ranks 265 on BallHype (#15 college blog) and Mondesi's House is an impressive 889, yet another crushing defeat for BSD in the credibility department. So you are saying BSD is more credible than your blog. Oh I believe that. You are just the good little indian I'm sure. I think it's also funny you toss out lines like 'homeristic' and 'personal attacks' when that blog is filled with both. The wonders of the internet I guess. I just hope you are not an English major. Apparantly you don't have a sarcasm detector. Apparently you don't have a college degree. NickDawg, for once, you're right about something. Mike was TOTALLY going for skinamax when he named the blog. People getting upset over someone attacking a blog is funny stuff...you got so mad about it too!!!! I love it.